Today my colleague ran into an issue where she added columns to a SharePoint 2013 list, later realised they were not what she wanted and was unable to delete them. I ended up doing up the following PowerShell script to delete the columns based on some examples I found online in both C# and PowerShell. The key one I found was on SharePoint Diary; however, this did not work for me but was close to what I had already started. This might depend on the type of column you are having issues with, but since I we were unable to delete these through the GUI this is what I ended up doing but wanted to document the other way as well encase down the road we run into a scenario that fits there original use case. I updated my script to write the results to a database to allow for easier manipulation of the data through queries, instead of having to traverse a file, linearly. The database design is very simple, consisting of only two tables, and can be easily expanded to contain more information about the device. The bold fields in the tables are required fields. 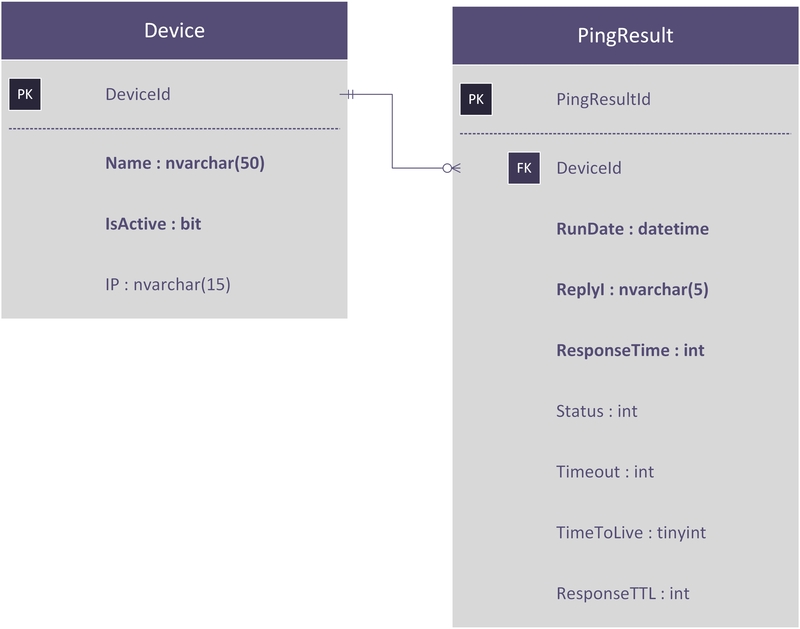 There is a 1-to-many relationship between the device and the ping results, since each result can only be for one device, but each device can have many results. The full script can be seen at the bottom of the post. The script starts a job running the ping script block 4 times, sleeping for 14 seconds in between. It is not an exact science here, but the idea is that the script can be scheduled using Windows Task Scheduler to run every minute and will ping all the machine on first starting and about every 15 seconds to make 4 times in a minute. $sqlConnection = new-object System.Data.SqlClient.SqlConnection "server=IT-SERVICES\SQLEXPRESS;database=PingResults;User ID=username;Password=pass;"
Note that the username and password have been changed. A command object is then created, where the only thing we need to set is the command text (what we want to execute on the SQL server), which in our is a SQL statement to retrieve the device ID and name for only devices that have been marked as active. We need both as we are pinging the devices by its name and when inserting we need to be able to link the result to the correct device, which as noted above in the database design is reference by the foreign key (FK) DeviceId in the PingResult table. Once the command text is set we execute the command by calling ExecuteReader(). $sqlCommand.CommandText = "Select DeviceId, Name from [PingResults].[dbo]. [Device] where IsActive=1"
The returned results are then looped through, pinging each machine in turn and formatting the results into the proper format for a SQL insert statement. Since we cannot insert null into a tinyint column we set the response time to live and response time to -1 if the returned result is null or empty. -1 is chosen since it has no practical meaning in this context (i.e. you can’t have a negative response time). $sqlInsertQuery += "(" + $deviceId + ",'" + $RunDate +"'," + $status +"," + $timeout + ","+$ttl+","+ $rttl +",'"+$ri+"',"+$RT+"),"
The $sqlInsertQuery is initialized to store the start of the insert SQL statement and then each row to be inserted is formatted and appended to the end of the query, utilizing the line above. Once all results have been concatenated to the query the loop exits and the trailing comma (,) is trimmed. The database connection is then closed. A new connection is opened, setting the command text to the built SQL insert statement, executed, and then closed. 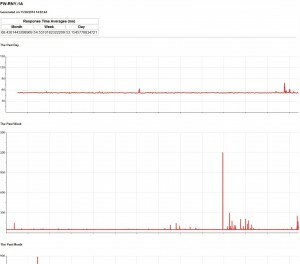 This means for each run of the script block 2 queries are ran against the database. The first is to retrieve the list of active machines and the second is to do an insert of all the results. The next phase of this project is to read the results that have been accumulating in the database to generate the appropriate table and graphs. 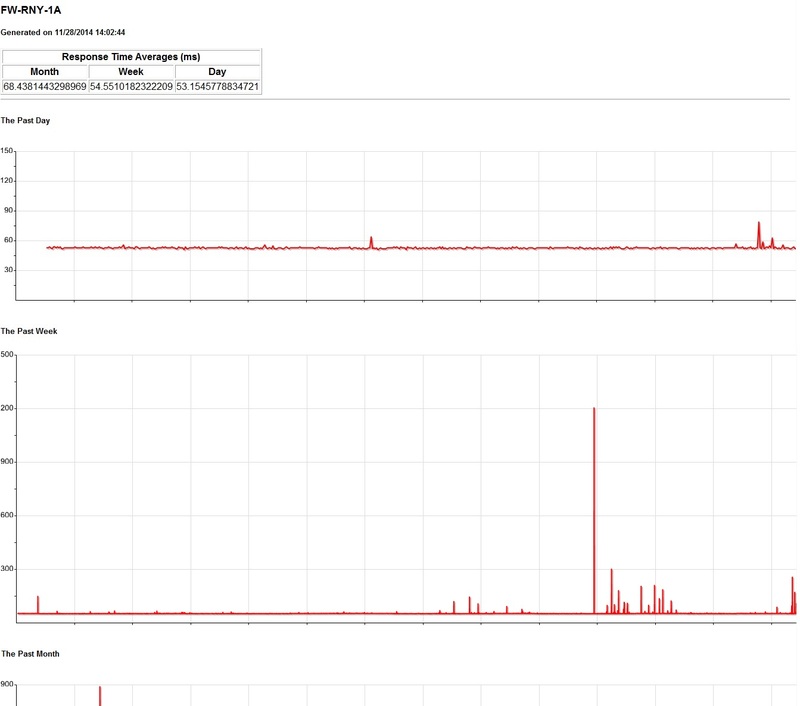 Each row of the table is going to consist of the machine name (linking to it’s day, week, month graph webpage), the percentage of down time over the last 120 points (30 minutes) and the average latency over the same interval. 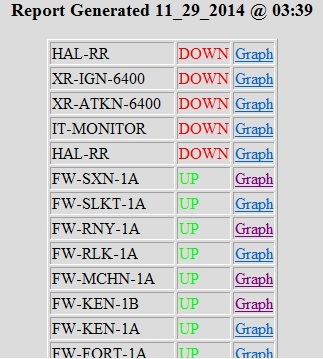 The last recorded latency will be displayed in a column with the font colour indicating whether the device is up (green) or down (red). $PingStatus = Gwmi Win32_PingStatus -Filter "Address = '$MachineName'"
Write-Host "Waiting for jobs to complete"
This is a project that came out of a wish list from a coworker to monitor, at a glance, if something is up or down as well as have a bit of a history to analyze for any slow or dropped pings, hence the graph. The first phase (script) ping.ps1 for performing the ping tests is from an external source that my coworker found and then modified by the two of us to get what we want, the second phase of the process is GeneratePingCharts.ps1 written by me to generate the graphs from the output of the first script using RGraph which is an HTML 5 charts library. I am writing about this one first since I wrote it from scratch. The script calculates the ping response time averages for month, week, & day utilizing the data collected and saved in a CSV file and outputs the graphs and averages to an HTML file. For flexibility I allow the folder containing the CSV files, where the HTML should be outputted, and the location of the RGraph library files to be passed as parameters to the script. The script starts by outputting the CSS utilized and then gathers the list of files containing the CSV extension from the folder path passed in. For each file found a new job is started, with a maximum of 10 jobs running at a time, to process the CSV file. The script waits for all 10 jobs to finish and then removes the jobs prior to starting 10 more jobs. This process continues until all files have been handled. The script block then initiates the processing of the CSV file by calling the Process-CSV function. The CSV file is imported into a variable using the Import-CSV PowerShell cmdlet followed by each row being processed. The sum of all the response times and number of response times collected is tracked to calculate the averages. The response times are stored in a string with the format [a,b,c,….,z] where a-z is the response time value and will contain as many as there are stored in the CSV for the given time frame. The only exception to this is month, which stores the average response time over $mInc points; otherwise, the graph would not draw do to the large quantity of points. All this data is then stored into a custom object which is passed to the Generate-Chart function. Day, week, and month graphs contain the appropriate data points. Worth mentioning is that the Get-My-Date function is used to convert the date stored in an unsupported format (MM_DD_YYYY) to a supported format (YYYY-MM-DD) so that within the Process-CSV function the date can be compared against today’s date allowing the script to know which graphs the ping result belong too. 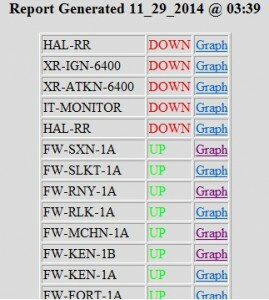 Creates a graph based on RGraph functionality and outputs all results to an HTML file. .\GeneratePingCharts.ps1 -csvFolderPath "C:\scripts\RESULTS" -outputPath "C:\Program Files (x86)\Lansweeper\Website\PingGraphs" -rGraphJS "../js"
Reads a csv file in the appropriate format and calculates the last month, week, day response times (RT) as well as every date and response time. $mDataToolTips += "'" + $row.RunDate + ": " + $row.RT + "',"
$wDataToolTips += "'" + $row.RunDate + ": " + $row.RT + "',"
$dDataToolTips += "'" + $row.RunDate + ": " + $row.RT + "',"
$mChartData += [String]$avg + ","
$mDataToolTips += "'" + $row.RunDate + ": " + [String]$avg + "',"
$wChartData += $row.RT + ","
$dChartData += $row.RT + ","
$mChartData = $mChartData.Trim(',') + "]"
$wChartData = $wChartData.Trim(',') + "]"
$dChartData = $dChartData.Trim(',') + "]"
$mDataToolTips = $mDataToolTips.Trim(',') + "]"
$wDataToolTips = $wDataToolTips.Trim(',') + "]"
$dDataToolTips = $dDataToolTips.Trim(',') + "]"
Write-Host "Out of For waiting for last jobs"
The script reads a list of machine names listed one per line in a text file (named servers.txt below) and then loops through every machine and rights the results of the ping to a CSV file as well as the up results to a file with the appropriate HTML to append to the down HTML so that all the downs are displayed at the top. The script also writes the machine name, state (up/down), run date, ping time, status code, timeout, time to live (ttl), response time to live (RTTL), reply inconsistency (ri), and response time (RT) to a CSV file for historical purposes as well as to feed the second script, detailed after the ping.ps1 code. This script is presently being run as a scheduled task every 1 minute. $htmlContent += "<head><meta http-equiv='refresh' content='15' ><p>"
$htmlContent += "<title> Ping Results </title>"
$htmlContent += "<h3><p align='center'>Report Generated " + $RunDate + "
@ " + $PingTime + "</p></h3>"
$htmlContent += "<table border='1' align='center' style='width:50%'>"
$htmlContent += "<tr><pre><h6><td>" + $MachineName + "</td><td><FONT color =#FF0000>`tDOWN</FONT></td><td><a href='./PingGraphs/" + $MachineName + ".html' target='_blank'>Graph</a></td></h6></pre></tr>"
$htmlContent += $data + "</table>"
The next phase of this project is to get away from the CSV files, as they are going to get extremely bloated. We want to run the ping.ps1 script about every 15 seconds, which will generate 4 times the amount of data. So what I want to do is break out the ping.ps1 script into two separate scripts. The first will be used to perform the actual pings, writing the results to a database, and then the second will read the results from the database to generate the HTML table of up/down results; which will also before formatted differently and contain some additional information. The GeneratePingCharts.ps1 script will then be modified to obtain the results from the database instead of the CSV file.